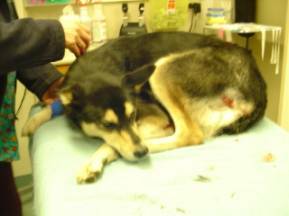 This is the story of Luna, a 3 year old female mixed breed husky, who was hit by a train. After being hit, Luna got up and ran away. Fortunately for her, the other dog she was walking with quickly found her and her ‘Mom’ recognized that she was in shock, despite the fact Luna was still able to walk and only appearing mildly distressed. After an initial assessment, an intravenous (IV) catheter was placed and she was given intravenous fluids. 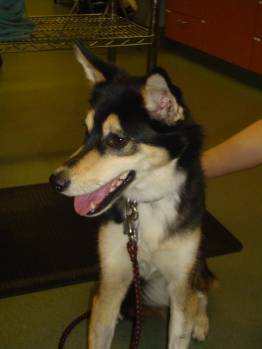 Luna had sustained several lacerations (wounds), but she did not appear to have any obvious broken bones. She was given medication to control the pain. An initial ultrasound (called FAST for focused abdominal sonography for trauma) was done to look for any serious indications of internal trauma in her abdomen. Radi ographs (x-rays) of her chest showed that she had a moderate pneumothorax. A pneumothorax is a collection of air in the space around the lungs which can put pressure on the lungs and cause them to collapse. Two of her ribs were fractured. 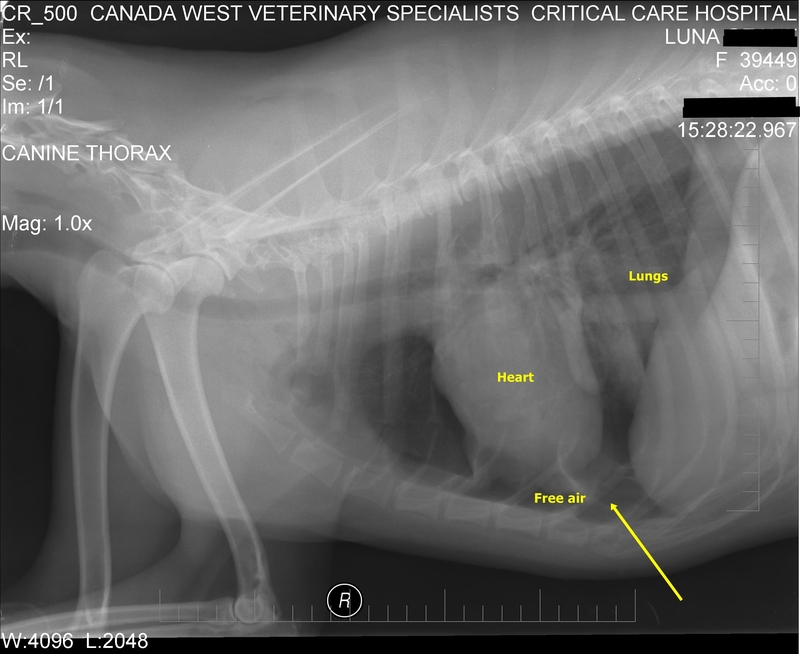 Luna was given a light sedative and a needle was inserted in her chest so that the air accumulated outside of her lungs (free air) could be removed. This was done to make her breathing more comfortable and to prevent a fatal accumulation of air. Once the air is removed, the patient needs to be monitored to make sure a large amount of air does not return. In cases where the air keeps accumulating, a chest drain may have to be placed. Almost a liter of air was removed! Luna was monitored closely and her vital signs evaluated frequently. The following day another X-ray of her chest was taken to see if her pneumothorax had recurred (it had not). She was sent home later that evening. We recommended a restriction in her activity level for several weeks. Her family was also shown how to monitor Luna for any changes in her respirations and to monitor her wounds for signs of developing infection. Luna was a wonderful patient and we were thrilled she did so well. Here was Luna a week after her accident and this lucky girl looked great!